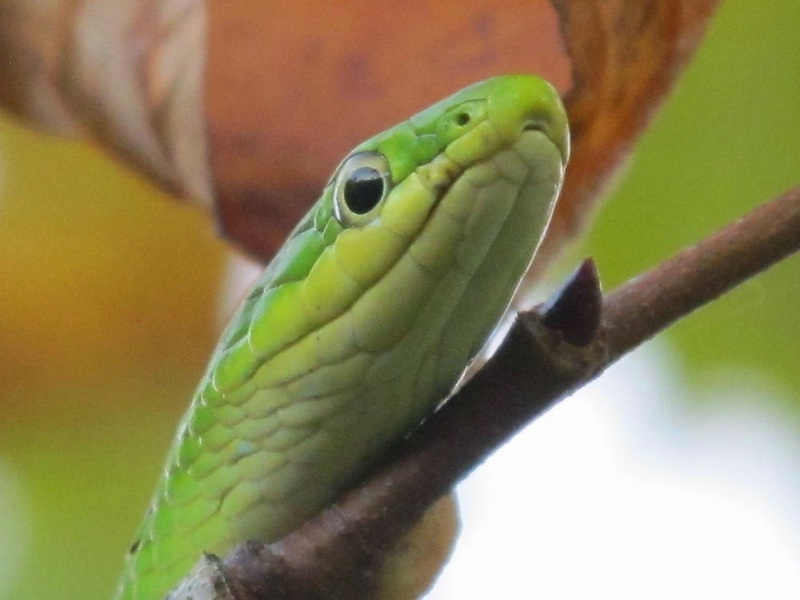 I have a feeling that even people who aren’t fond of snakes can’t help feeling kindly towards a cute little snake of green. 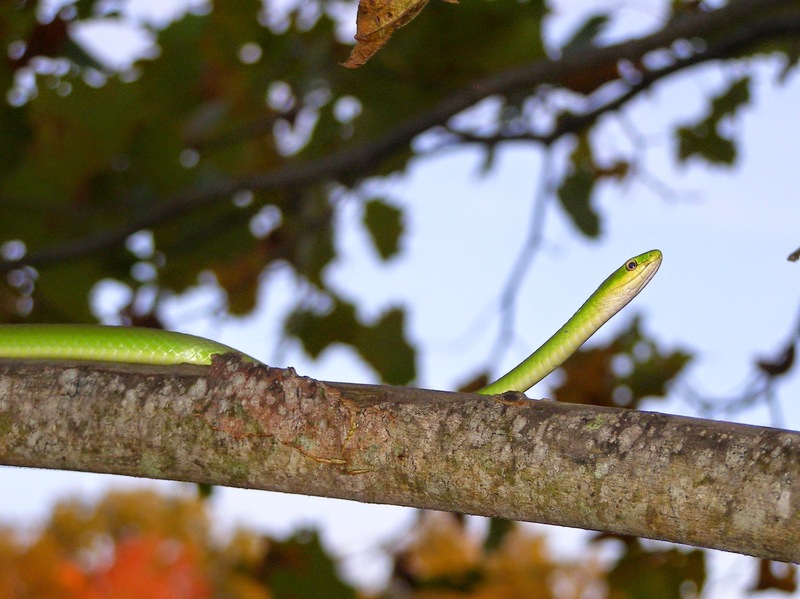 I found this Rough Green Snake when I revisited the Sycamore that yielded so many caterpillars a couple of weeks ago. It was caterpillars that I was actually looking for. At the time of the snake discovery, I was taking a close look at this Drab Prominent caterpillar. 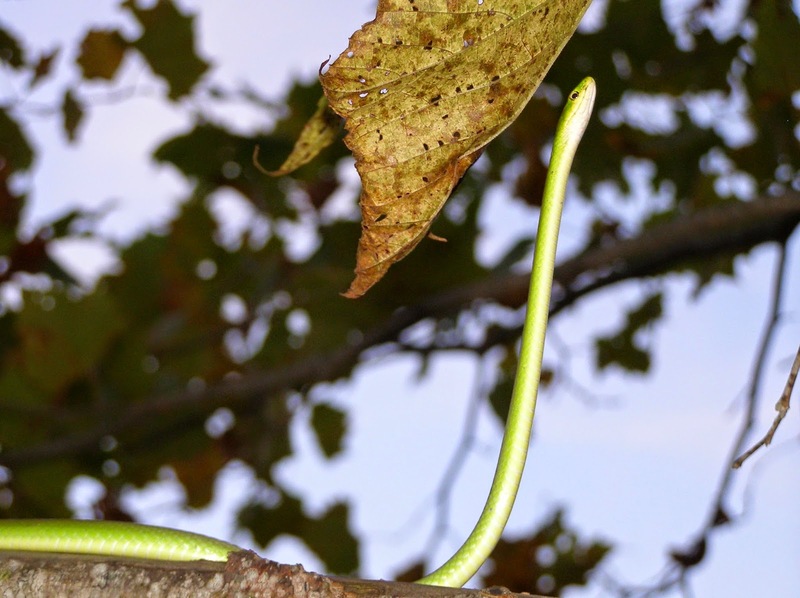 I lifted my eyes from the caterpillar and on a branch just a few feet away was the snake. 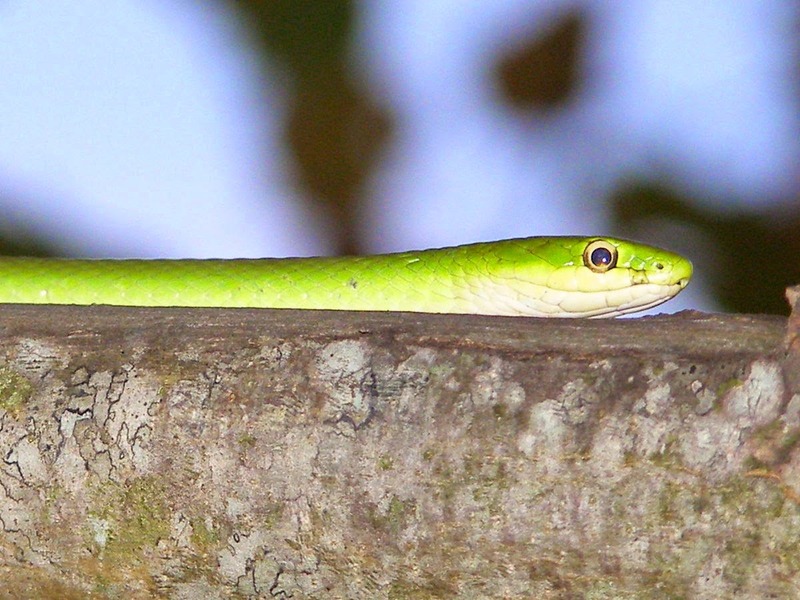 Green Snakes are insect eaters and hairless caterpillars are readily consumed. 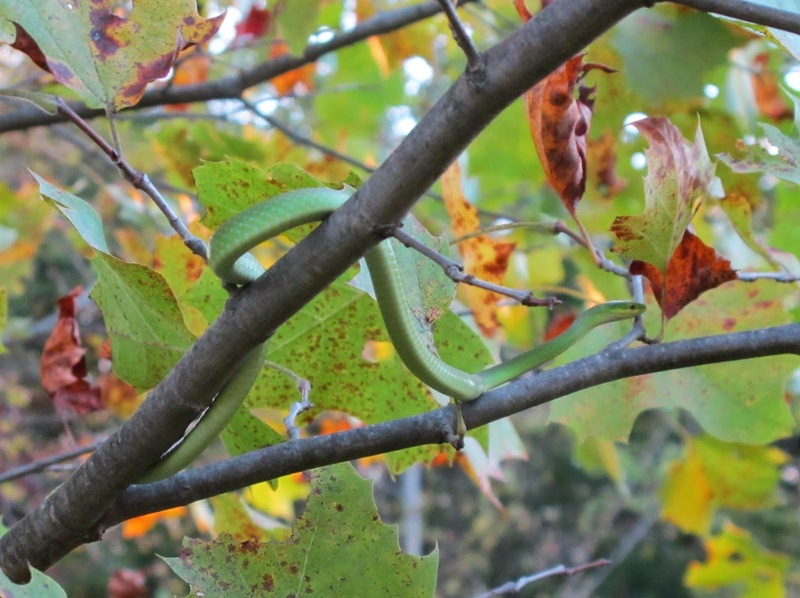 The snake and I may have been looking in this tree for the same reason. 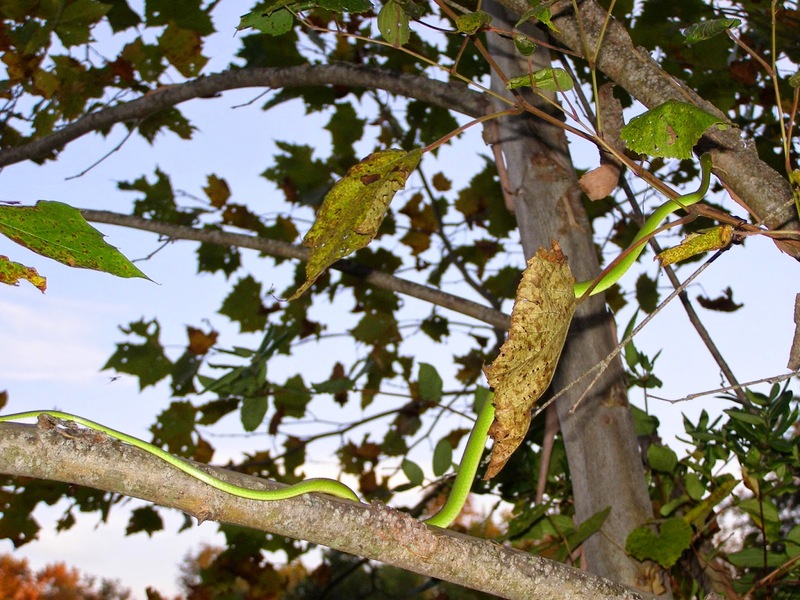 The Rough Green Snake is the only species of green snake likely to be in this area. Even so, on the rare occasions that I find one of these snakes, I like to verify the ID by checking the scales on the snake’s back. 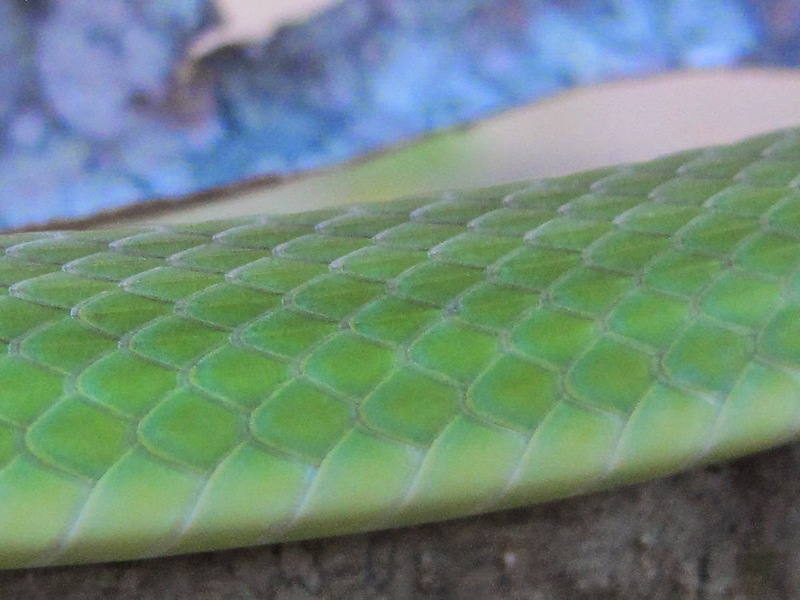 The scales of the Rough Green Snake are divided by a slight ridge. The ridges align to form faint stripes running the length of the snake. They also give the snake its rough feel that earned it its name. 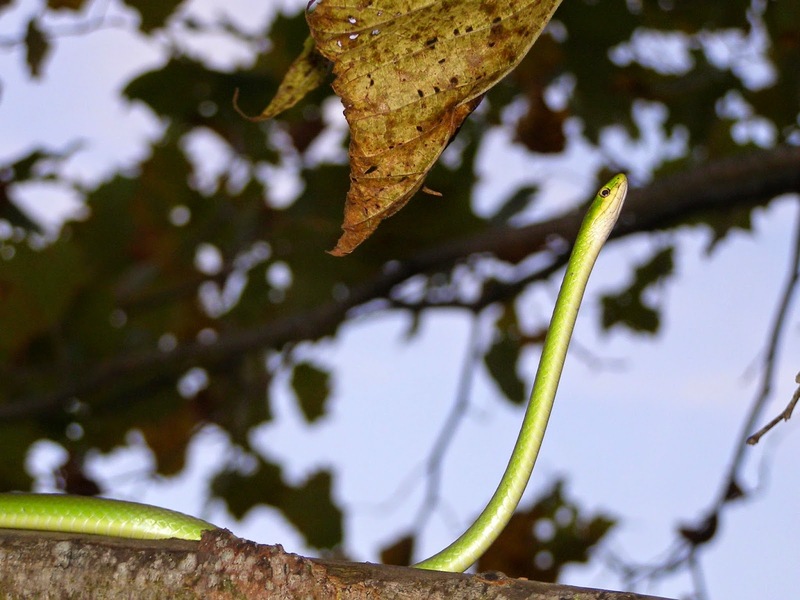 This snake is typically found in the trees and is remarkably adept at moving about through the branches. It must have remarkable balance and muscle control. It moves along a narrow branch as if it were traversing level ground. If it desires a higher elevation, it just lifts its head and goes up. It’s like a snake mime hitting an invisible wall. The head just continues to ascend. 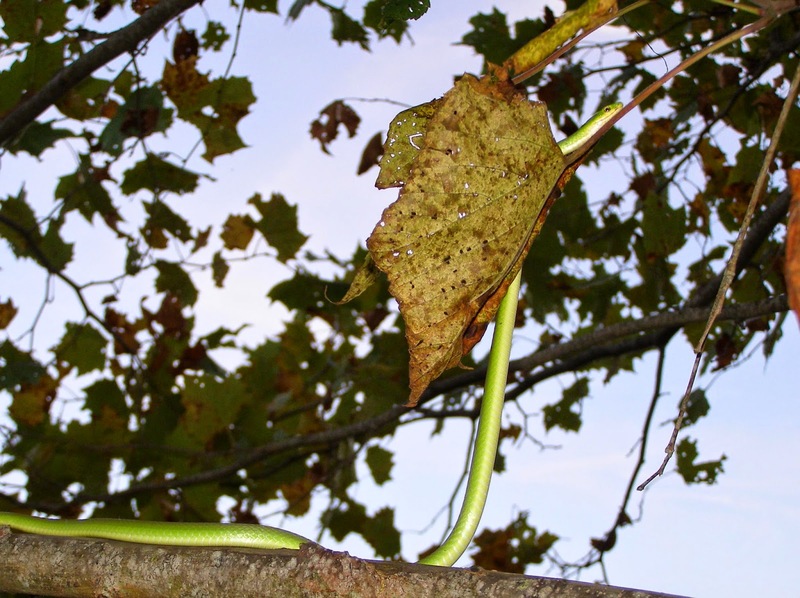 Finally the snake connects with the petiole of a grape leaf and begins to slide its body along the narrow stem. 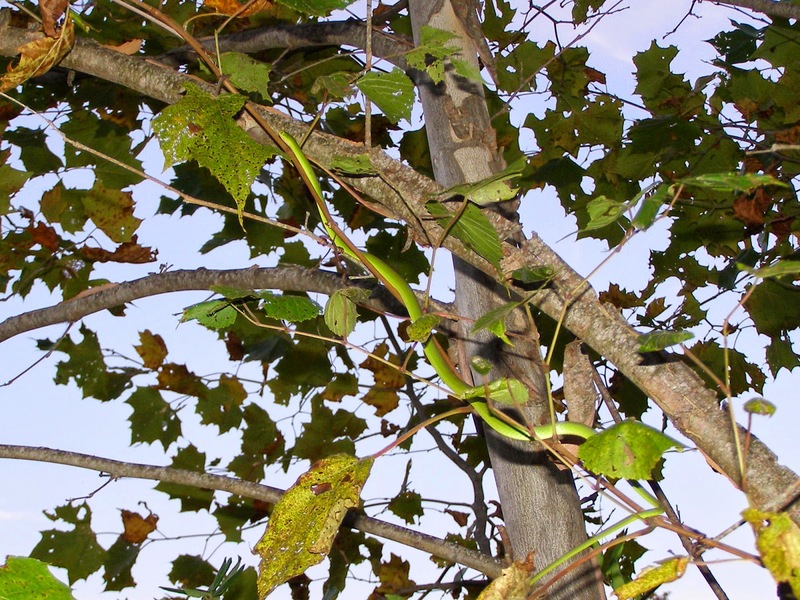 The diameter of the grape vine is smaller than that of the snake, but the snake proceeds along this new avenue without complication. Up and away, the snake climbs out of my range. Blue Jay Barrens had its first frost of 2014 on the morning of September 23. This is a full month earlier than last year. Only the most susceptible of creatures showed any signs of damage, but it’s an indication that most of the marvelous insects will soon be disappearing. 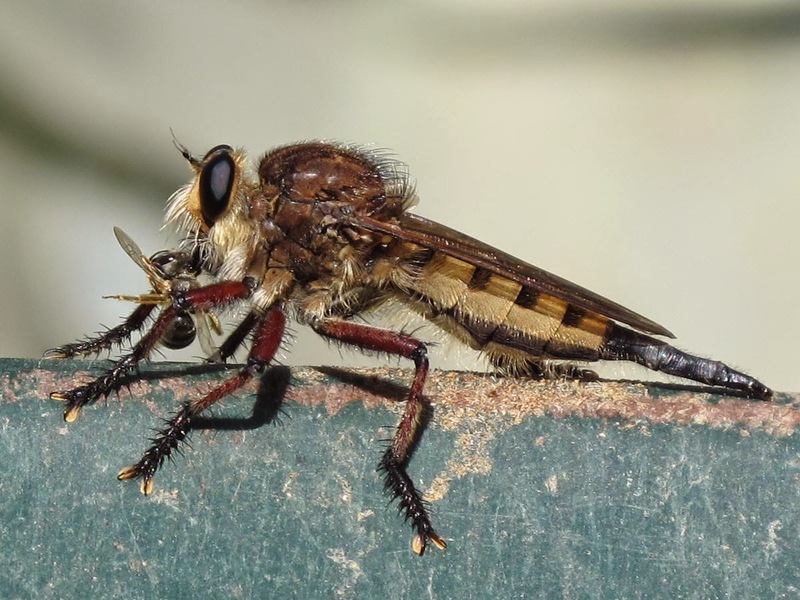 While doing some work near the barn, I had this big Robber Fly use the bed of my wheelbarrow as a hunting perch. This is a female Promachus hinei, a species that is quite abundant here during late summer. 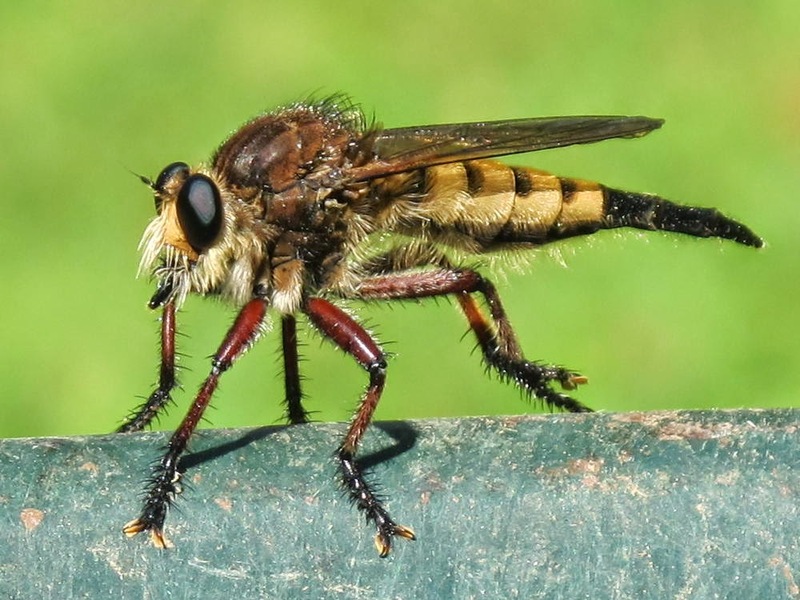 Robber Flies are predators that sit and wait for suitable prey to fly by. 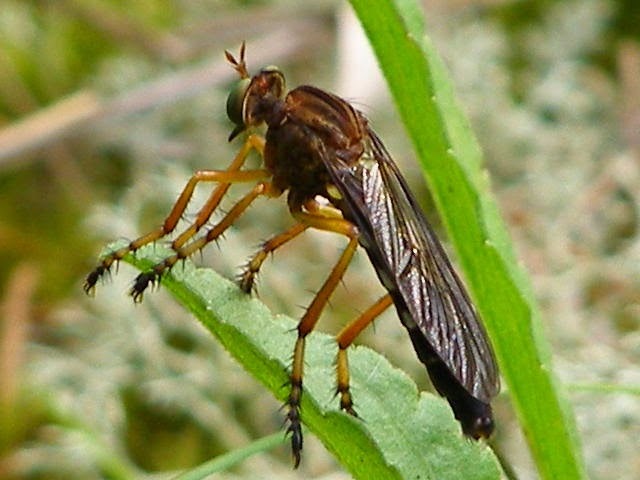 When a likely victim, such as a smaller sized flying insect, is spotted, the Robber Fly darts out and snatches it from the air. 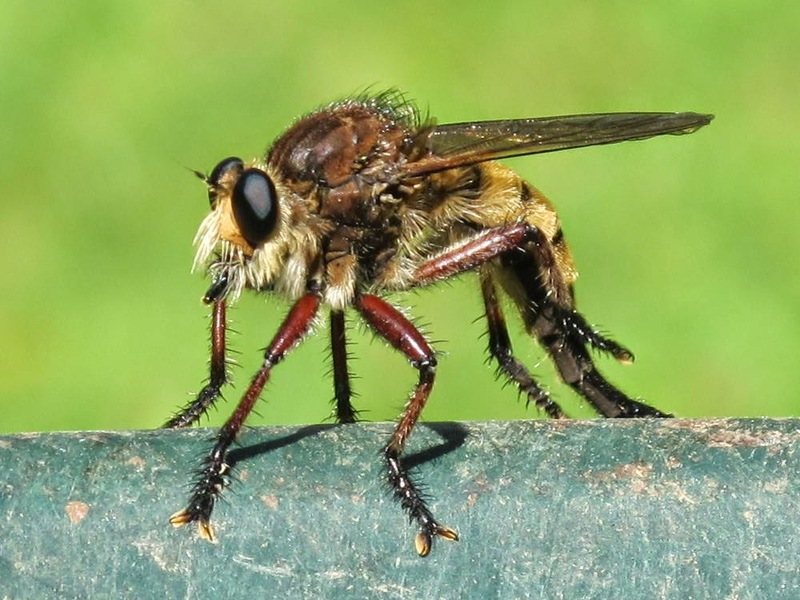 Like most flies, the Robber Flies spend a lot of time on personal grooming. 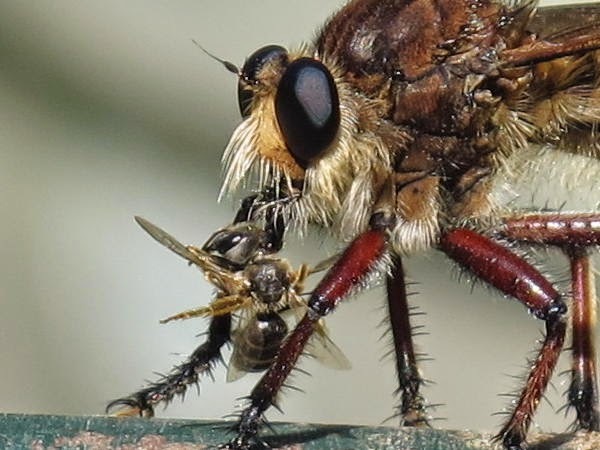 Even while combing its abdominal hair, the fly is alert for potential meals. The capture is quicker than my camera. 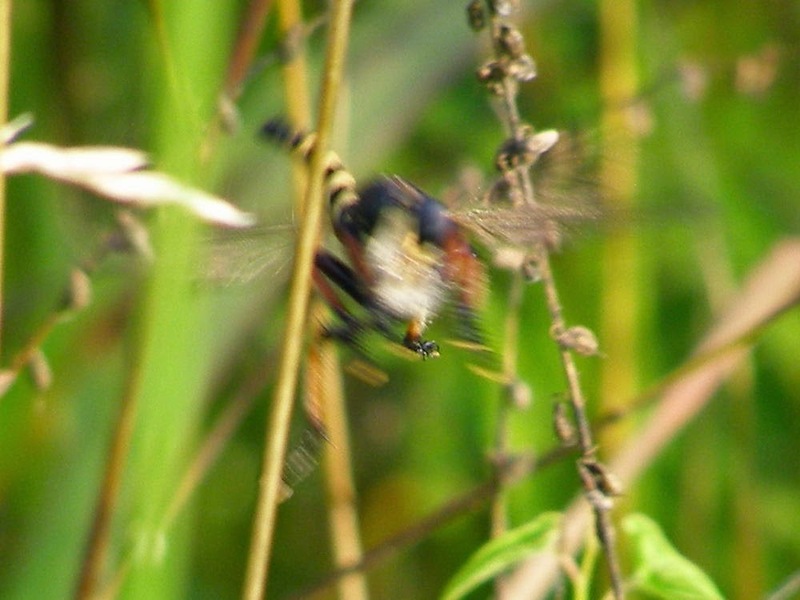 The Robber Fly is just a loud buzz and a blur as it grabs a passing insect. Usually, the predator will bring the catch back to the same resting spot for consumption. 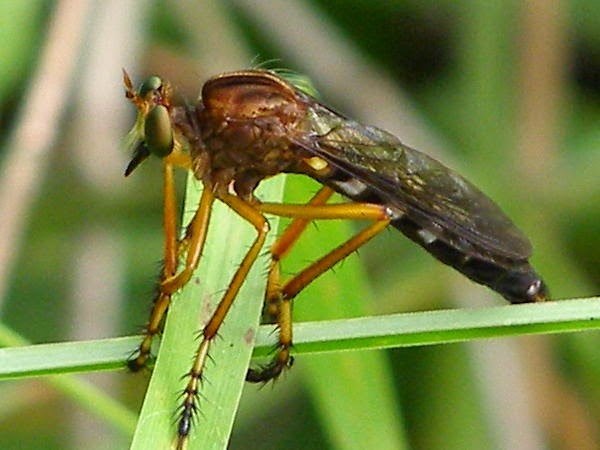 The fly inserts its tube-like mouth into the prey and begins to drink. The presence of four wings identifies the victim as a small bee. Feeding appears to occur rapidly, because this fly ate three of these bees in just a few minutes. It’s also possible that the fly just can’t resist a fresh kill and discards the previous catch before it is totally drained. I love watching these big flies hunt. 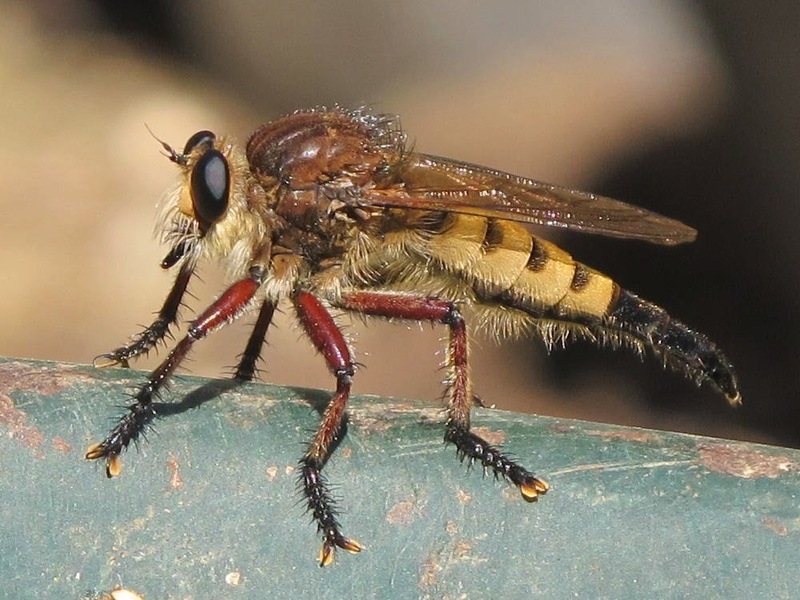 Later in the day, I found this medium sized Robber Fly. 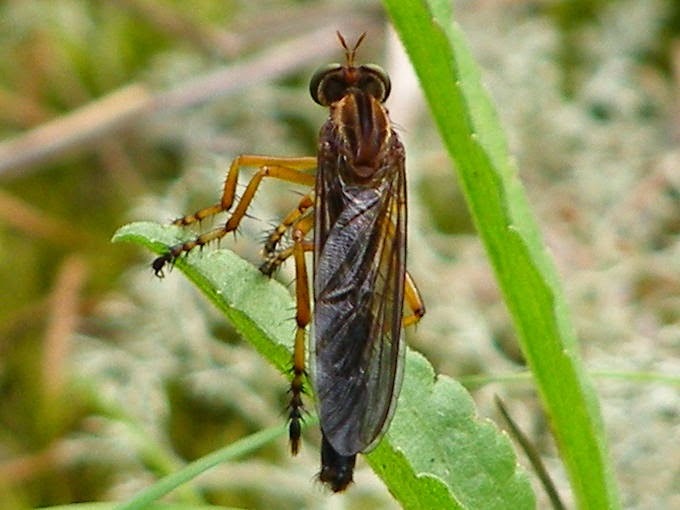 This is a species of Diogmites and it tended to perch down low in the vegetation. It also frequently changed its hunting perch. When it spotted something moving in the air, it quickly turned its head in that direction. 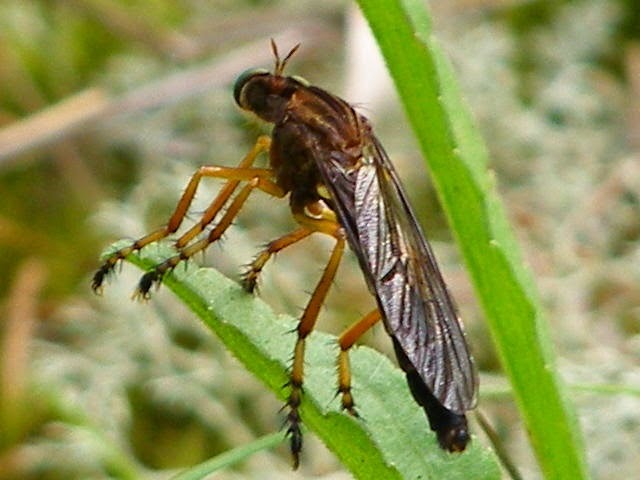 If the object of interest remained in view, the fly would realign its body with the head. I think this guy made a catch, but it didn’t return to its perch and I failed to see where it ended up. 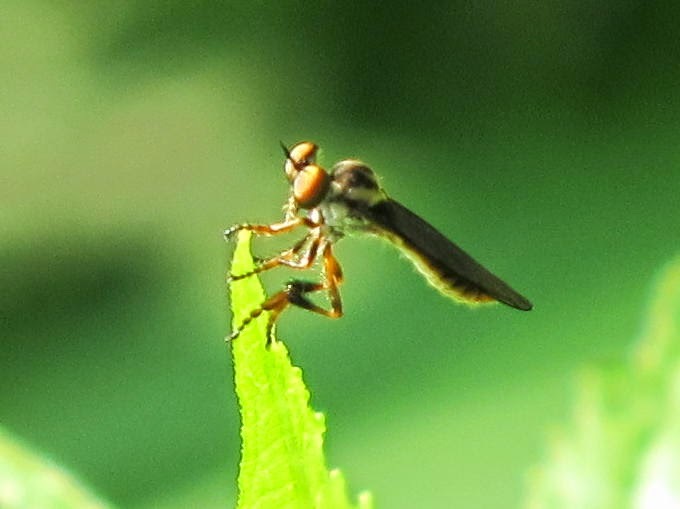 Soon after, I located this small robber fly from the genus Holcocephala. This genus is commonly referred to as a Gnat-Ogre and it may actually have eyes bigger than its belly. Gnat-Ogres perch on the tips of narrow leaves. The wind was blowing this little guy around so much that I wondered how it could ever focus on a passing meal. I’m going to enjoy the insects as much as I can before cold weather closes that particular avenue of pleasure. This is a male Polistes fuscatus, the Northern Paper Wasp. 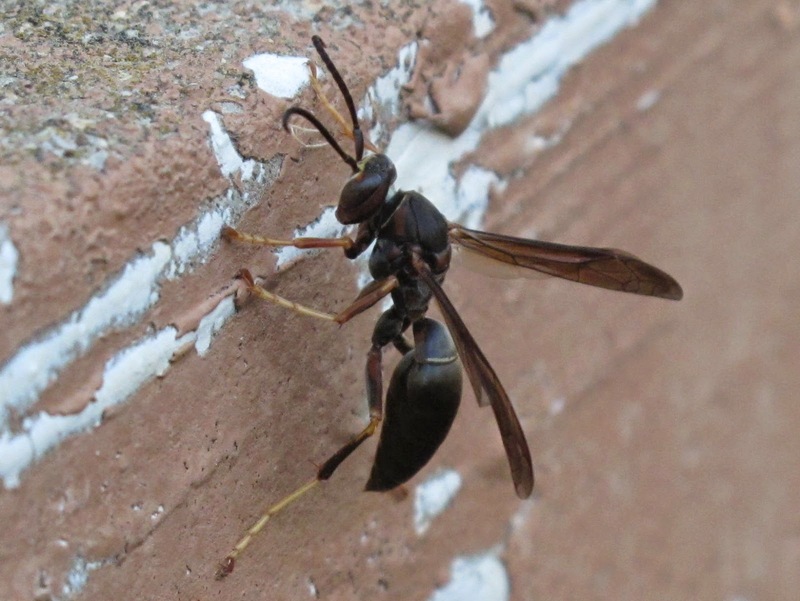 It is part of the group of wasps that creates the paper nests commonly found beneath the eves of houses, on porch ceilings and above door jambs and window openings. 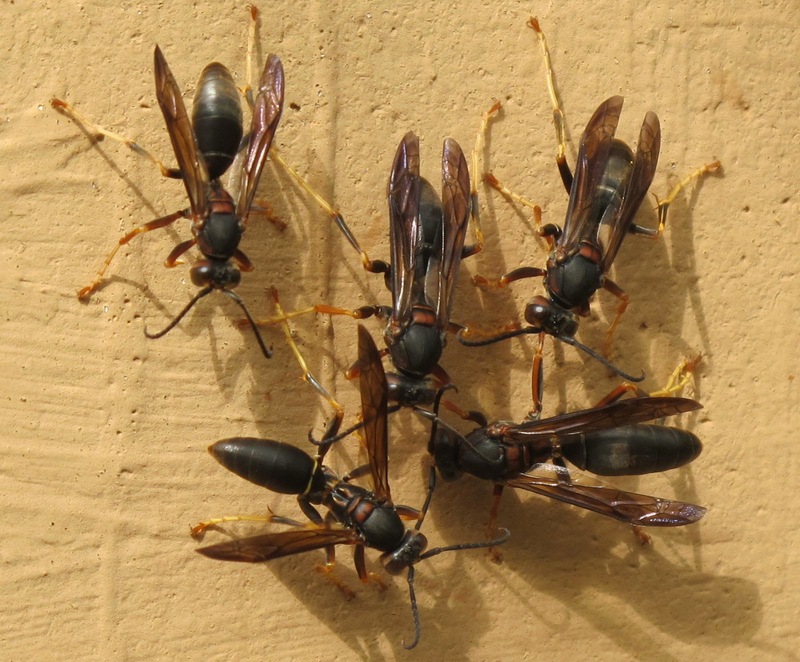 I encounter more nests of Polistes species than of all other wasp species combined. I find Northern Paper Wasp nests in many locations. Each nest is active for only one summer season. The nest begins in spring with initial construction by the founding queen and dies in the fall when newly produced queens leave to mate and find a place to spend the winter. For the past several years, wasps have constructed their nests inside the hollow spaces in the blocks used to create my barn walls. Access to the interior of the blocks is through these two holes that, at some pre Blue Jay Barrens time, held mounts for some type of apparatus secured to the side of the barn. 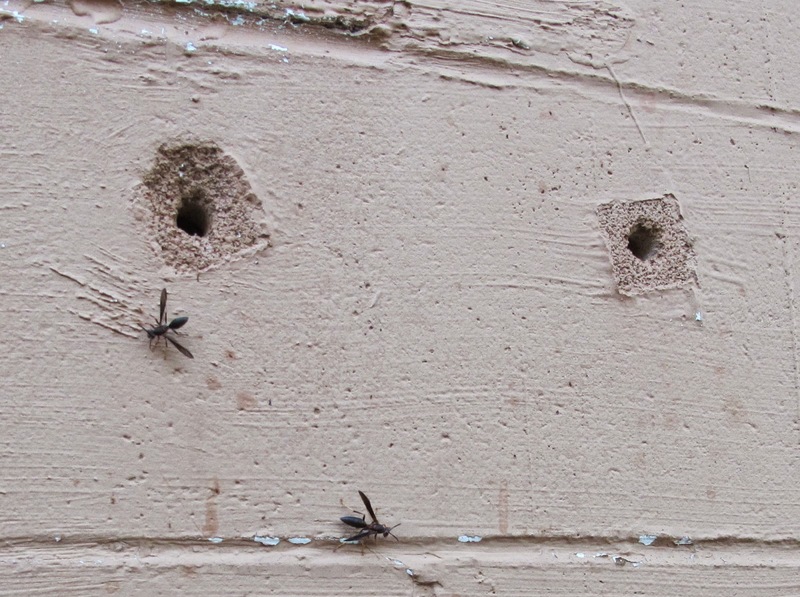 I’ve never seen the actual nests inside the blocks, but I’ve become accustomed to the cycle of wasp activity around the holes. The nest is approaching the end of its life. The queen has stopped laying eggs. She and her squad of workers are dead or dieing. 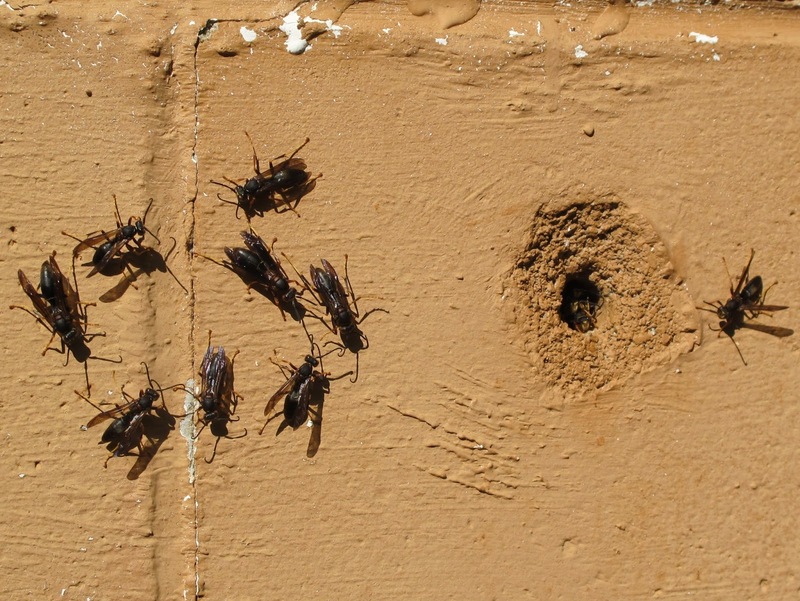 The bulk of nest occupants are males and unfertilized queens. As the number of workers decreases, the flow of food to the nest is interrupted. When the food supply diminishes, the female wasps respond by driving the males away from the nest. The first light of day reveals male wasps being given the boot. They struggle to remain inside, but the relentless females use as much force as necessary to push the males out. 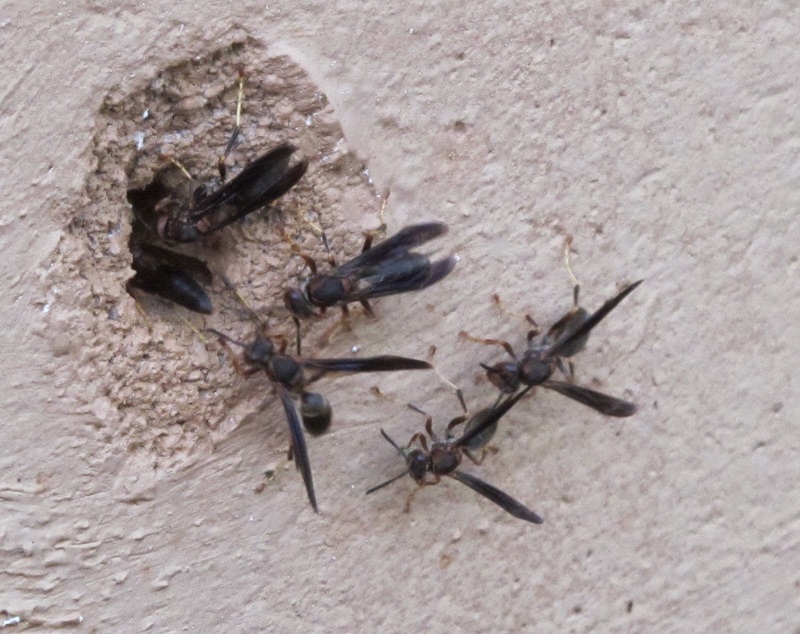 Male wasps, identified by their curled antennae and light colored faces, loiter in the area around the hole. The faces of the next group to be turned out can be seen at the entrance to the hole. The wasps don’t go far from the nest. They will spend most of the day lounging on the wall. Occasional forays are made to a nearby water source. The males spend considerable time socializing. Some of the activity appears to be an attempt to solicit food from each other. While in the nest they would have been fed by worker females who spent much of their life foraging. The function of a male wasp is to mate with a female. 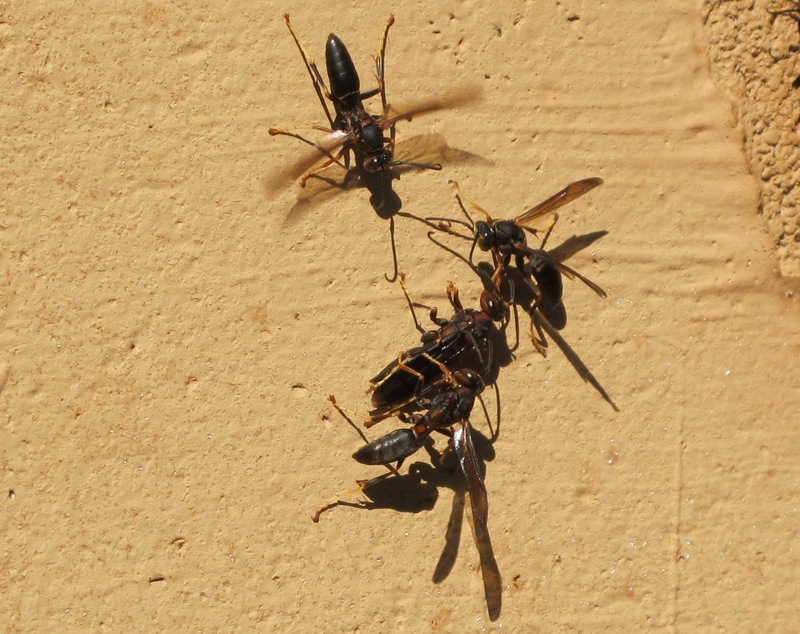 At this time of year they will attempt to mate with any wasp, male or female, that comes by. 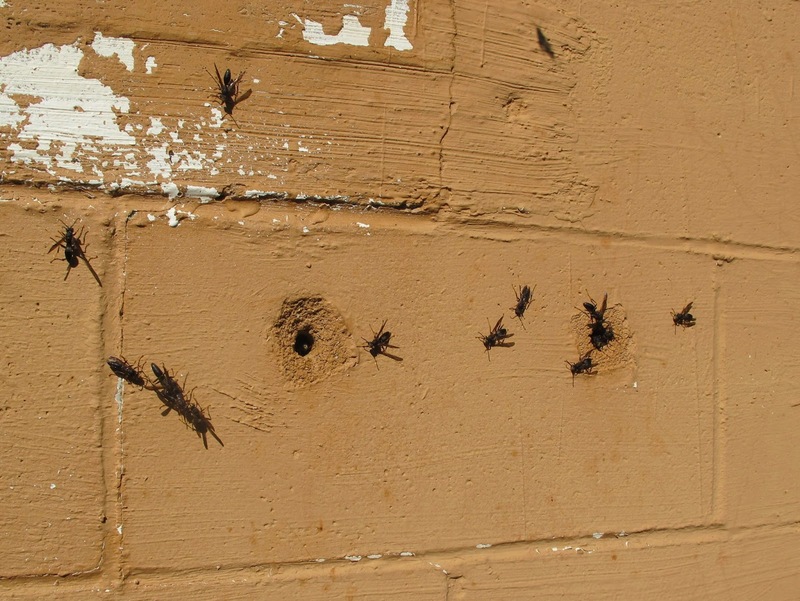 A wasp flying to the wall arouses an instant mob of males. Males are attracted to concentrations of females. As long as the young females are still present in the nest, the males will stay close. The females will soon leave to find suitable hibernation sites. The males will follow and at that time will interact and mate with females from other nests. Males will not survive the coming cold weather. As temperatures drop with the setting of the sun, the males are allowed back into the nest. The time is rapidly approaching when the wasps will be absent and the buzzing inside the wall will cease. I expect next summer to again see the familiar flight of wasps flying to and from these holes. 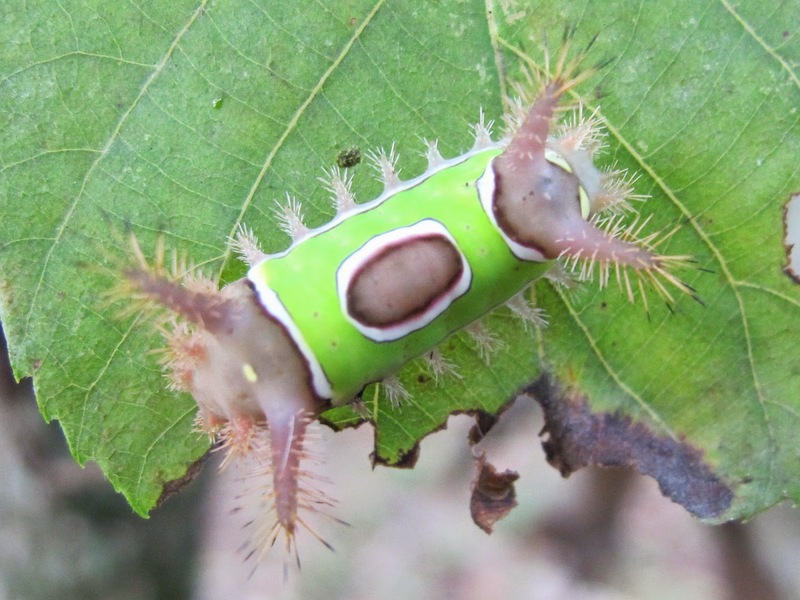 An early morning encounter with a Saddleback Caterpillar made me believe that it may be helpful to some if I were to provide a few more images of this remarkable creature. 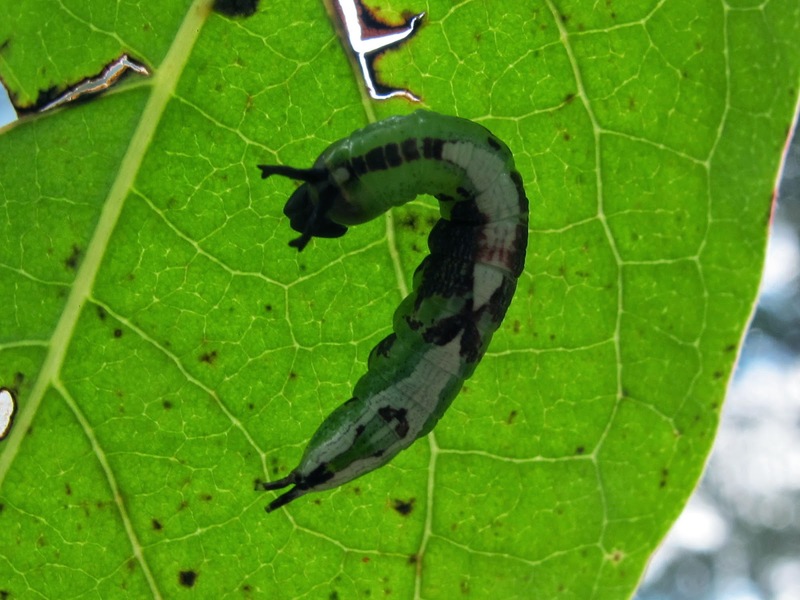 I’ve been seeing large numbers of this species on a variety of different trees and shrubs. 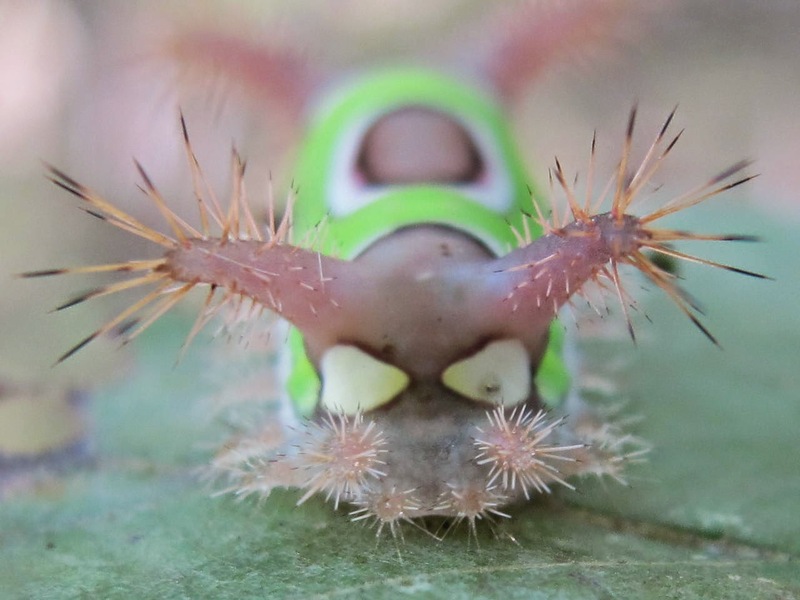 Those stinging spines suggest how this caterpillar can make a lasting impression on an unsuspecting person. Each of those spines contains a chemical irritant that makes initial contact with the power of a wasp sting, progresses into a chemical burn and finally settles into an intense itch that lingers for several minutes before dropping to a mild irritation causing brief periods of itching for an additional hour. 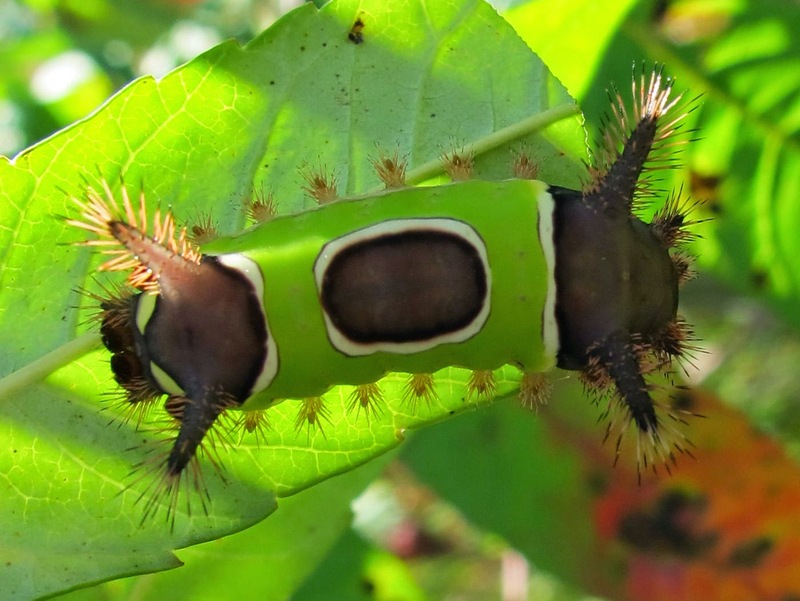 The brown and green pattern on this caterpillar makes it difficult to see as it sits feeding on a leaf. However, once you have a search image in mind, they are pretty easy to locate and avoid. Unfortunately, it’s usually not the ones you see that give you a sting; it’s the ones hidden from view beneath the leaf that catch you by surprise. You can easily see the caterpillar to the left, but it’s the one farther down the stem to the right that’s liable to get you. This is the one that got me yesterday morning. I was leaning backwards, trying to get a look at a bird in a tree, when my shoulder pressed against the caterpillar. I think he got me with spines from all four corners. After rubbing my shoulder and voicing my dissatisfaction with the encounter, I decided to take a few shots of my assailant. It seemed totally undisturbed by my inadvertent blunder. 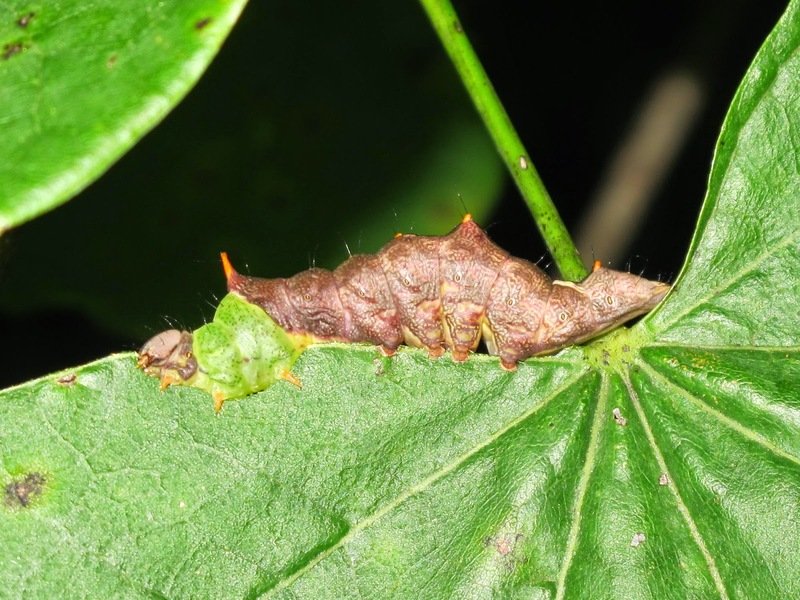 The actual head of the caterpillar is located beneath the first body segments and is generally hidden from view. A ring of spined protrusions protects the head from undesired attention. This is what you would see if trying to sneak up on the caterpillar from the rear. Two white spots give the appearance of a menacing creature facing down a potential attacker. Next year will be a lot of fun if all of these caterpillars live to produce adults in the spring. I decided to take a couple of hours and conduct a search for caterpillars. I’ve done that in the past, sometimes with dismal results. This time I already knew the location of a couple of interesting specimens, so I was sure the search wouldn’t be a total disaster. Far from being a disaster, my search was more successful than I imagined. 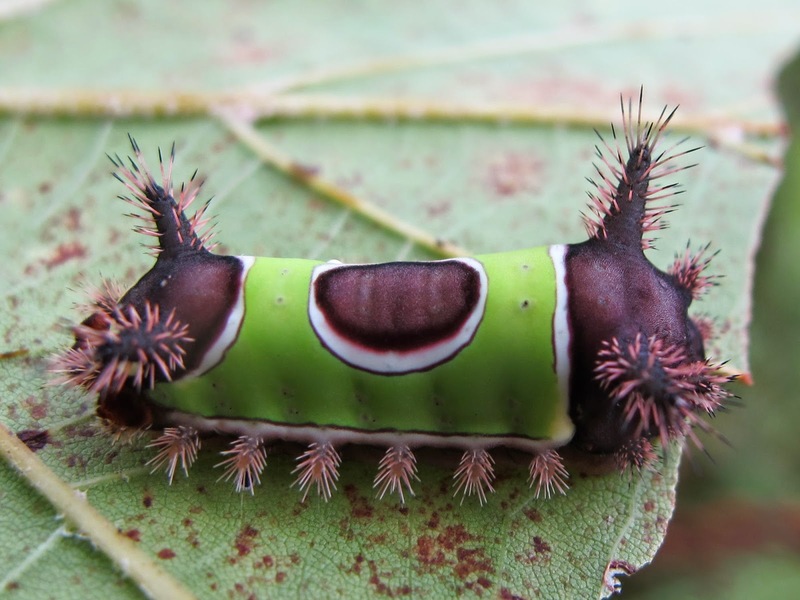 I begin with a species I had never seen before, the Skiff Moth caterpillar. This species looks so much like a leaf blemish that I would have passed it by if I hadn’t previously seen it in photographs. That’s a Sycamore leaf it is consuming. On the same Sycamore tree were dozens of these Saddleback Caterpillars. Those spines are capable of delivering a painful sting. 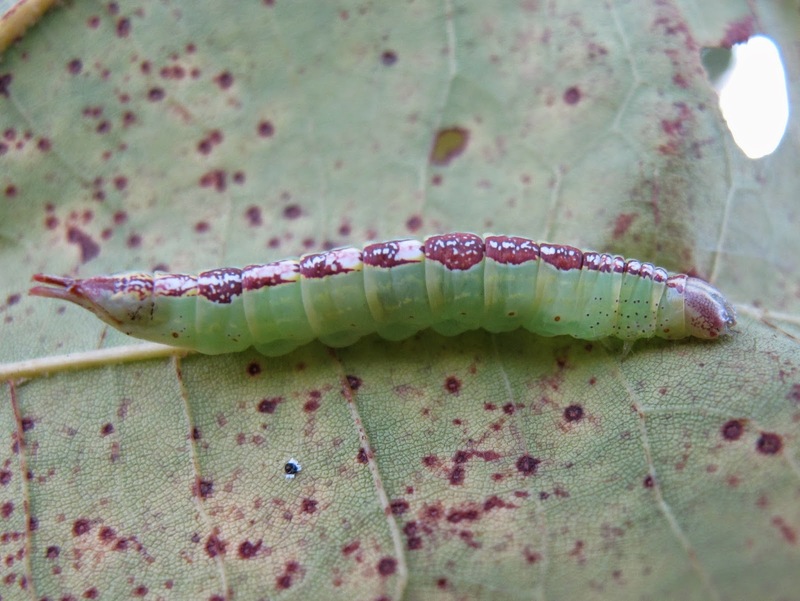 The caterpillars have the habit of feeding from the underside of the leaves and are often hidden from view. I managed to confirm the stinging ability of these caterpillars as I maneuvered the leaves in order to get some photos. 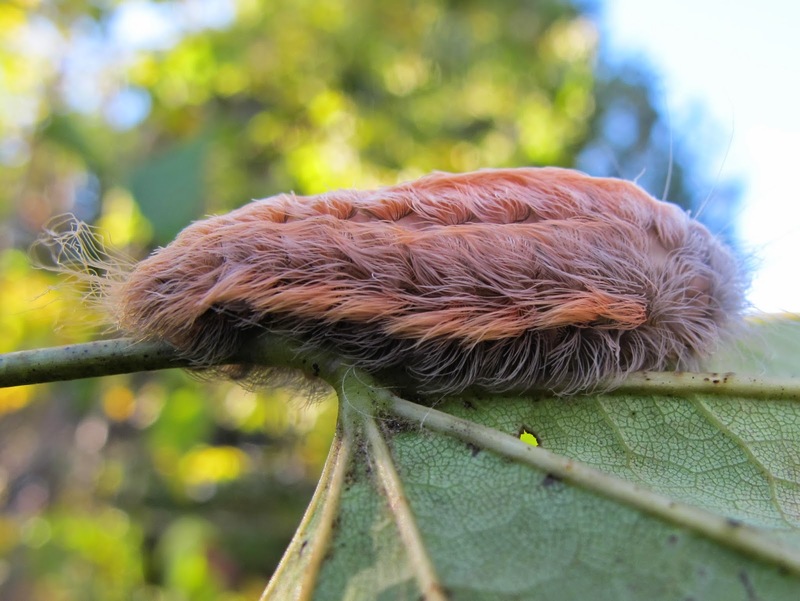 Another with stinging ability is the Black-waved Flannel Caterpillar. These look very much like a patch of fluff stuck to the leaf. Head and feet are neatly obscured, but the hair generally points toward the rear where a wispy tail is formed, so you can usually figure out which end ought to be doing the eating. 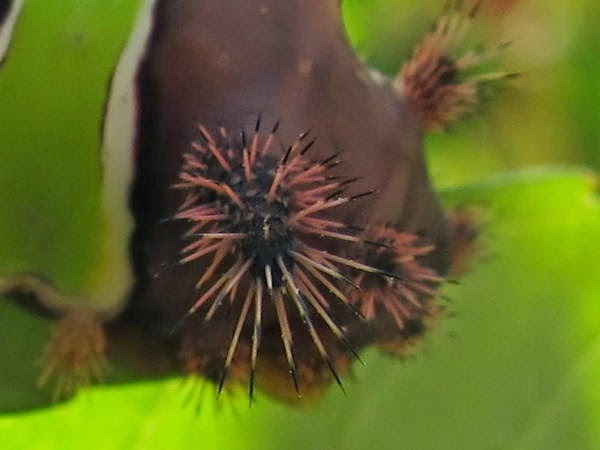 Not all hairy caterpillars contain stings. 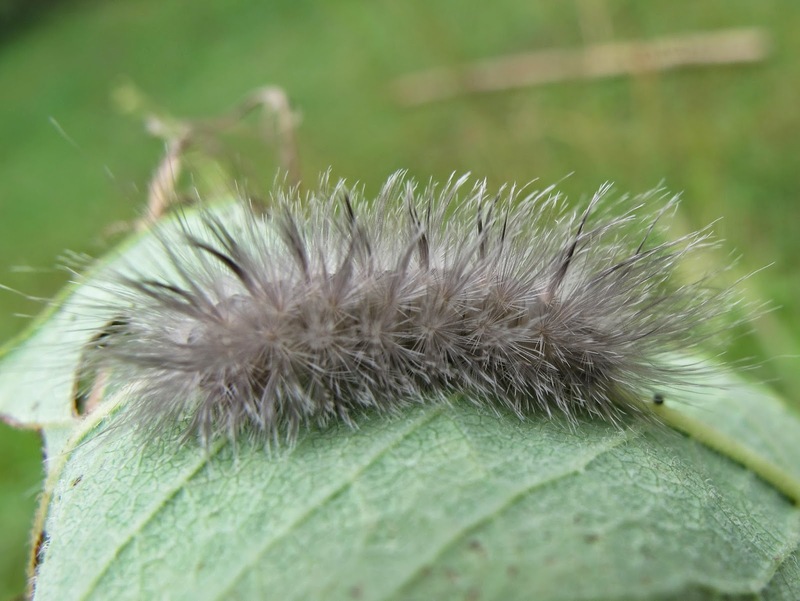 The Banded Tussock Moth may be the most noticeable caterpillar currently roaming Blue Jay Barrens. I’ve been finding them on every tree or shrub I search. 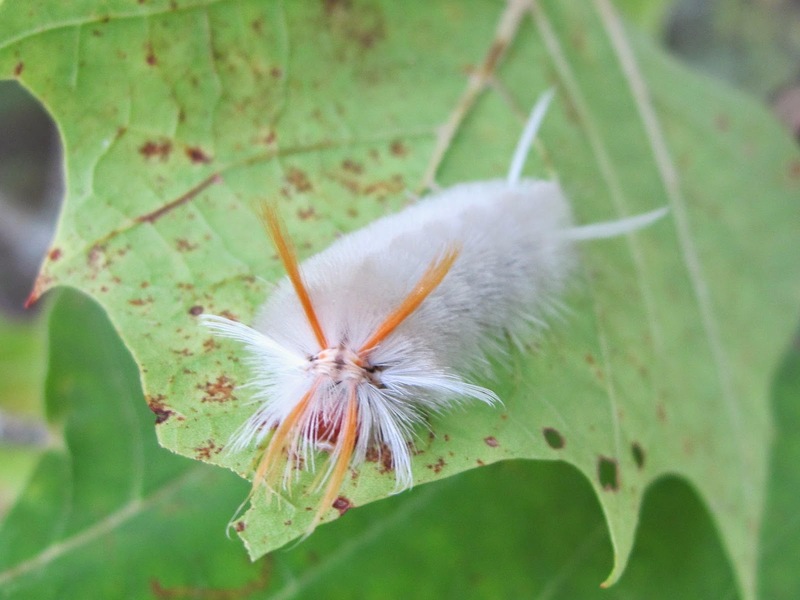 Banded Tussock Moth caterpillars have a range of color forms from light yellow to dark gray. I’ve seen half a dozen different colors this year. 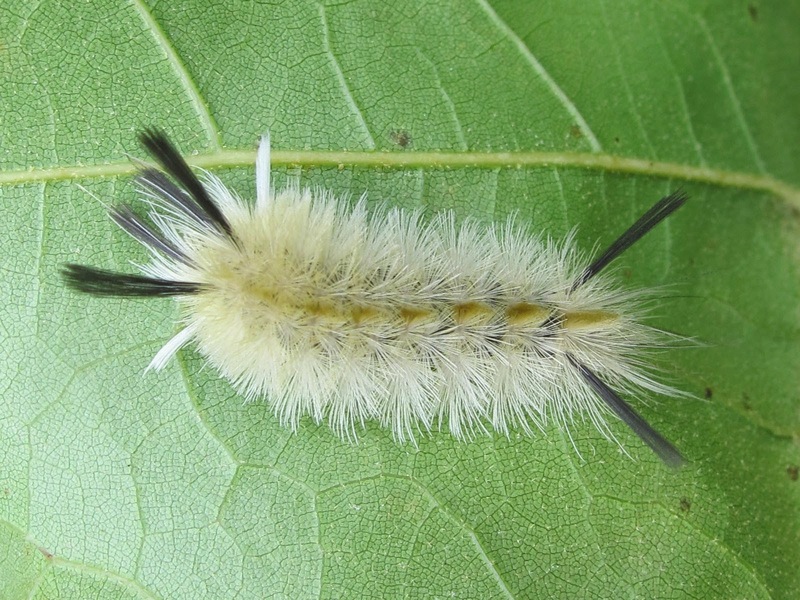 On the same Sycamore mentioned earlier, I found several sizes of the Sycamore Tussock Moth caterpillar. The Sycamore Tussocks also exhibited slight variation in color. Most showed some yellow, but a few were white. This is the head end showing the signature eyebrow and whisker tufts. 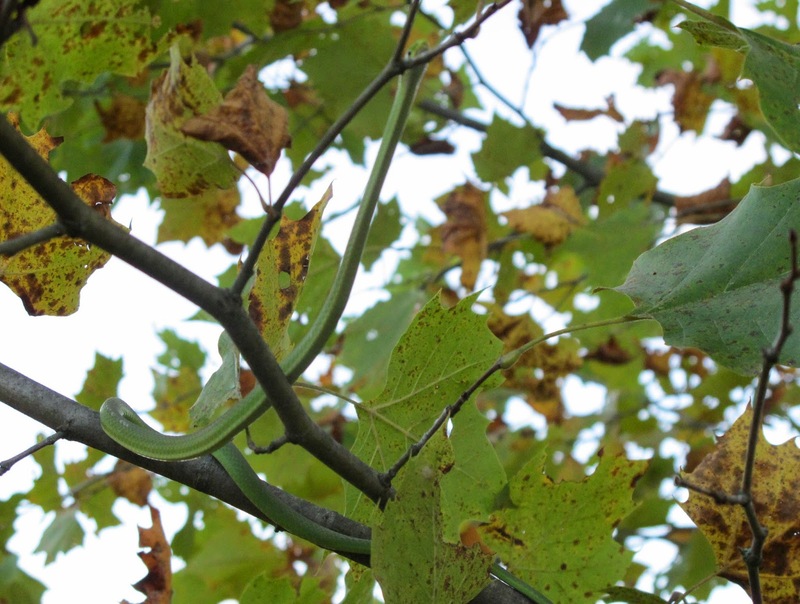 That Sycamore tree was a treasure trove of caterpillars. 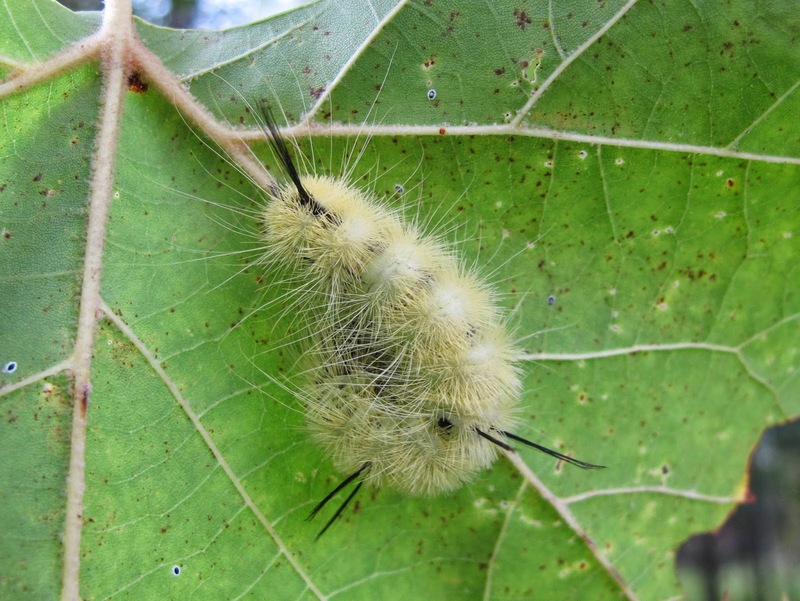 My first sign of caterpillars in the tree was the sound of fras, caterpillar droppings, falling through the leaves. Unfortunately there were only a few branches low enough for me to reach. I saw many American Dagger caterpillars resting beneath the leaves, but this was the only one close enough for me to photograph. 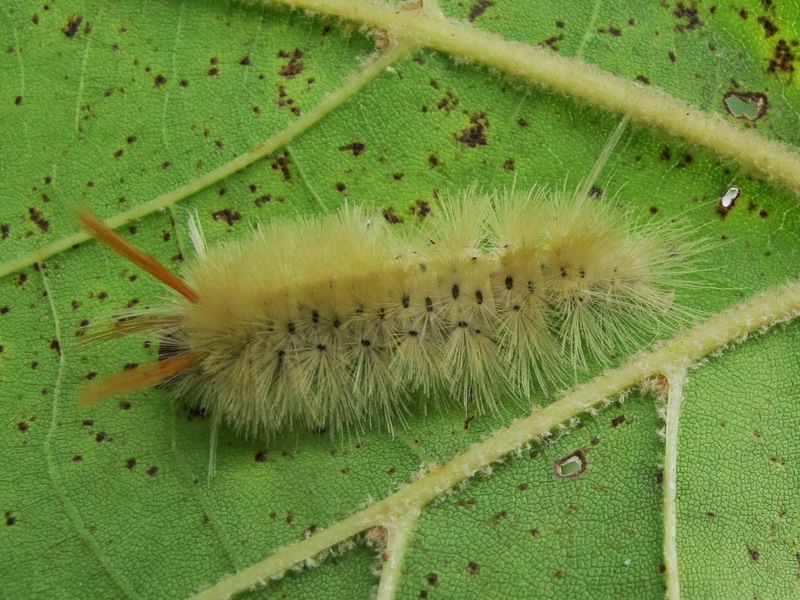 Turning the head back toward the body is a characteristic posture for a resting American Dagger caterpillar. 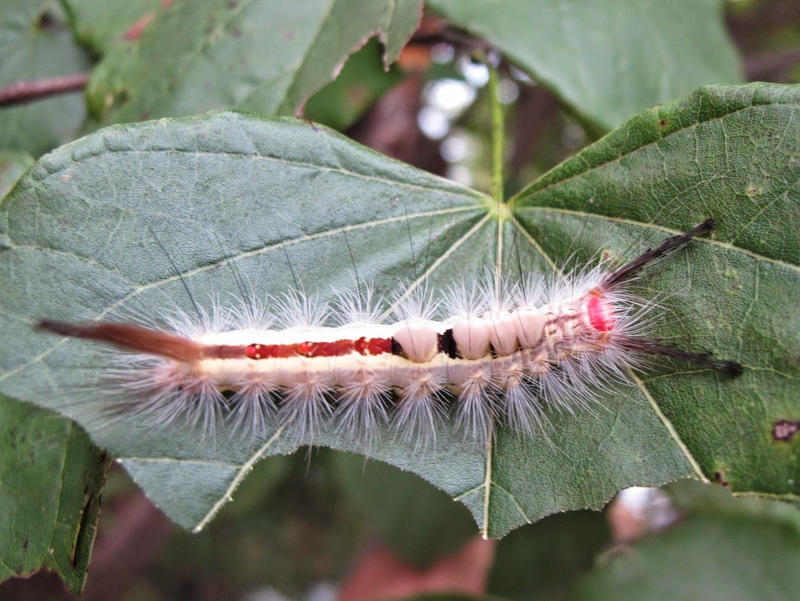 This White-marked Tussock Moth caterpillar has already eaten a large part of the Redbud leaf. 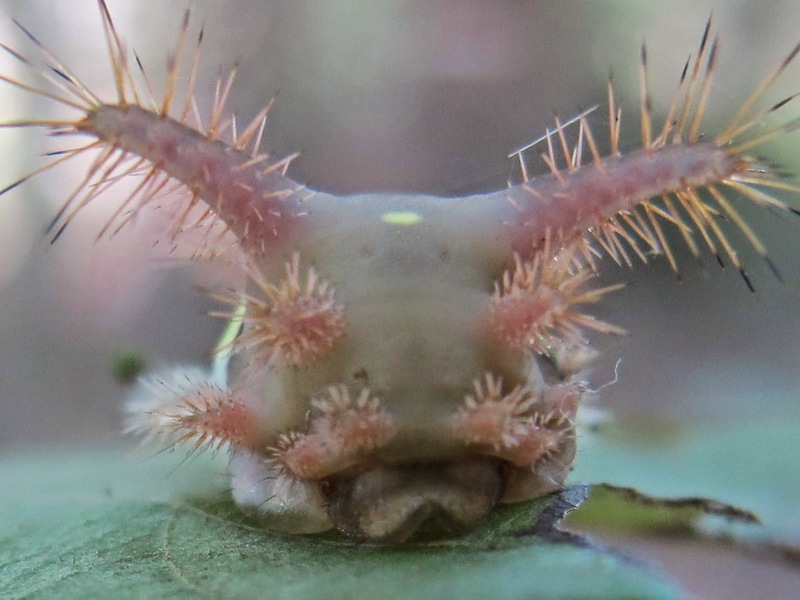 The forward and rear tufts of hair make me think scorpion whenever I see this caterpillar. 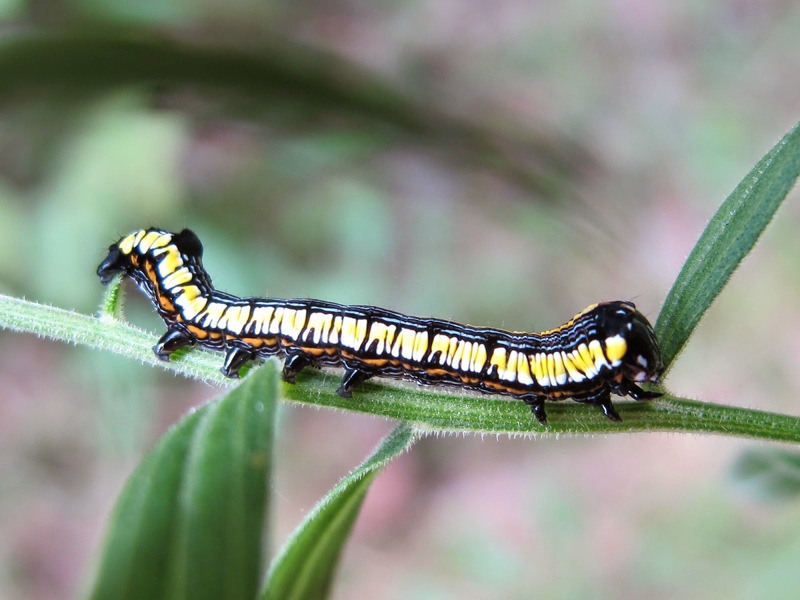 The Delicate Cycnia caterpillar feeds on Dogbane. A patch of Sweetclover that I mowed earlier this summer also contained several Dogbane plants. 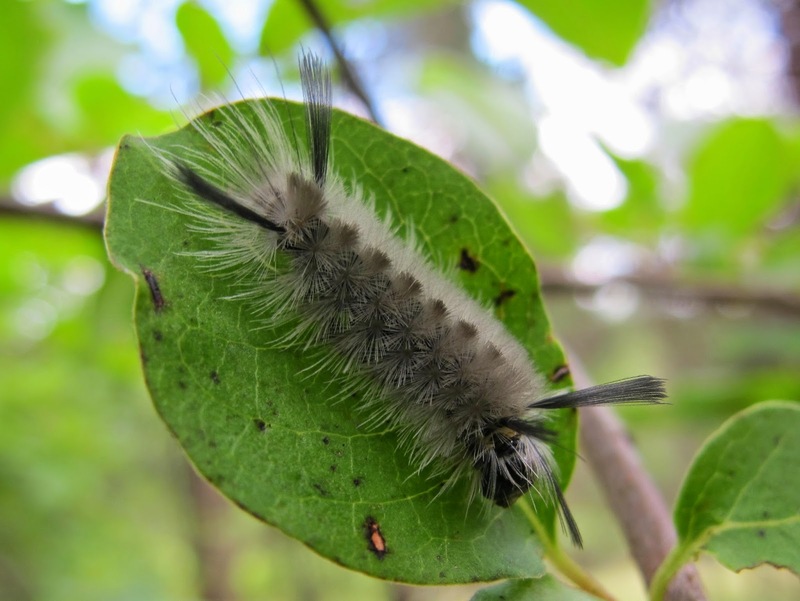 Those plants regrew and now have the fresh, young leaves preferred by this caterpillar. Not all of the caterpillars I found were covered by hair. 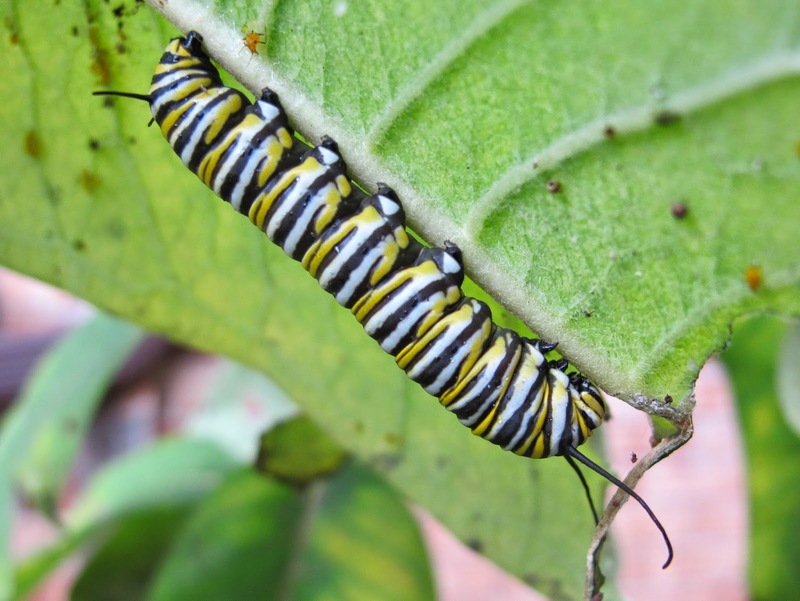 I’m still finding Monarch caterpillars on the Milkweeds. I can’t remember ever having a year where I’ve seen so many Monarch caterpillars. If Monarchs are doing this well elsewhere, the wintering grounds will be overloaded. 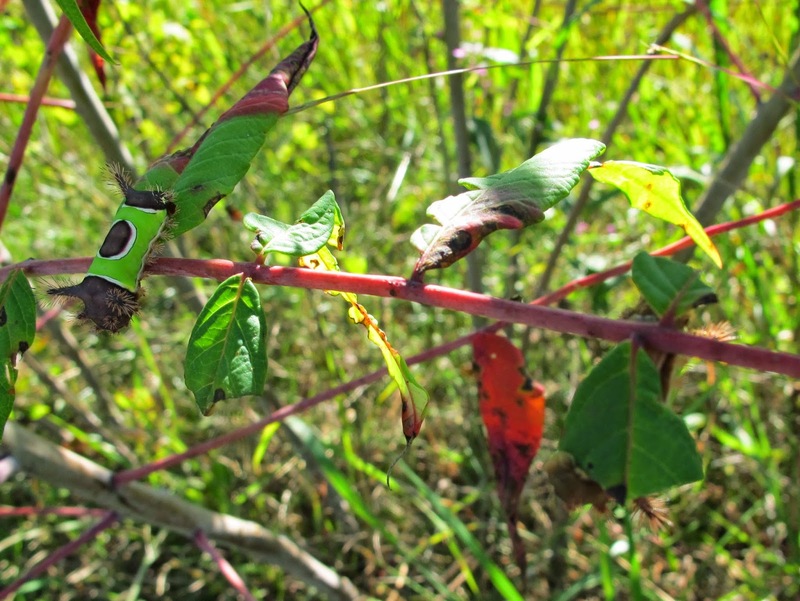 I found this bright little Calico Paint caterpillar feeding on Lance-leaved Goldenrod. 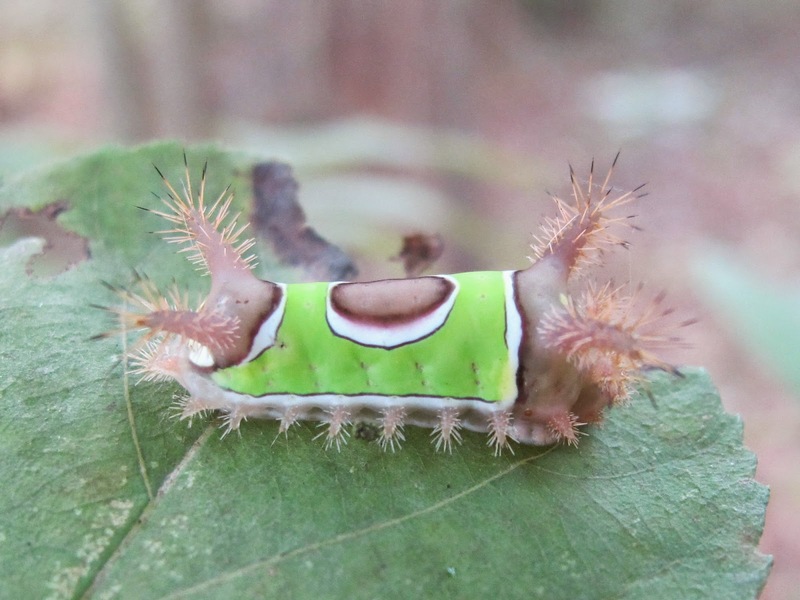 This is an early instar individual and has yet to reach the most colorful stage of its development. 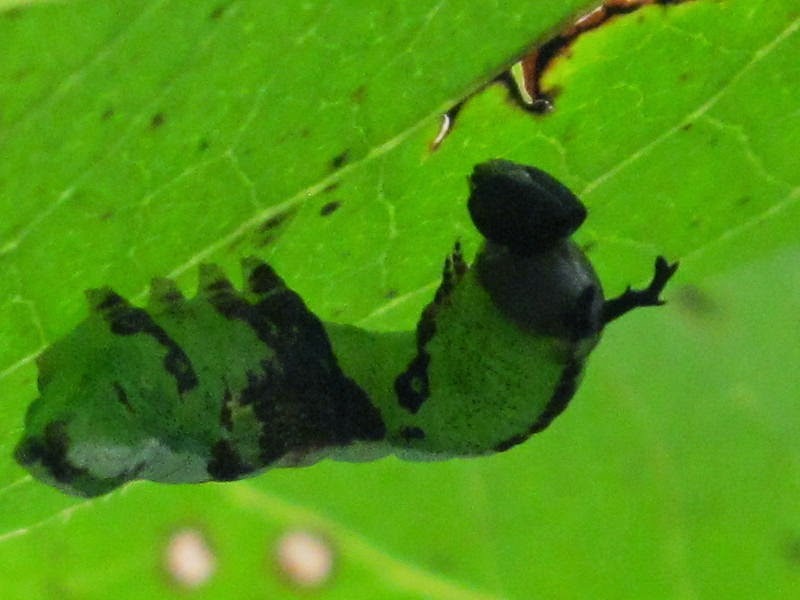 The Checkered-fringe Prominent caterpillar is a leaf edge mimic. 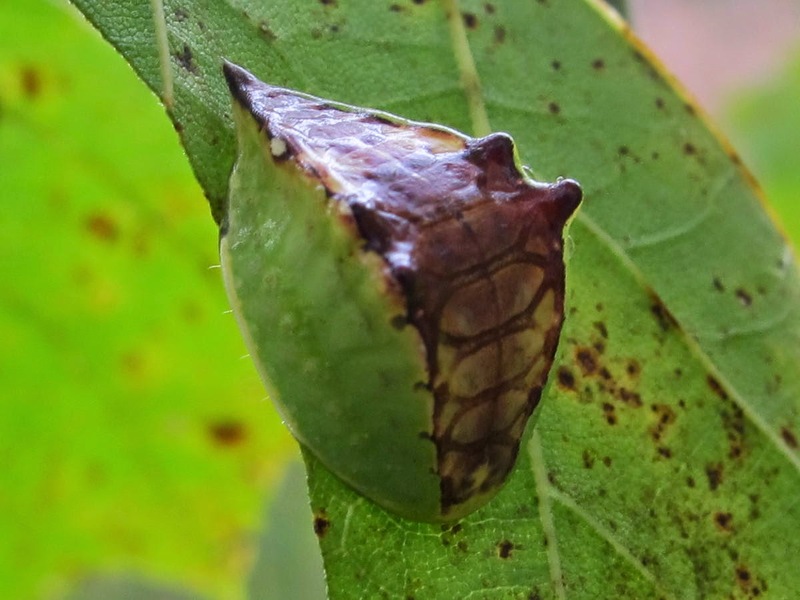 Its body fills in the void left by feeding and gives the appearance of a portion of leaf that has withered due to some unfortunate experience. This guy fed much more slowly than I’ve come to expect from caterpillars. Perhaps rapid feeding spoils the mimicry effect. I found this fellow beneath the leaf of a Persimmon. This is a Wavy-lined Heterocampa. Although it is supposed to be very common, this is the first I have encountered. 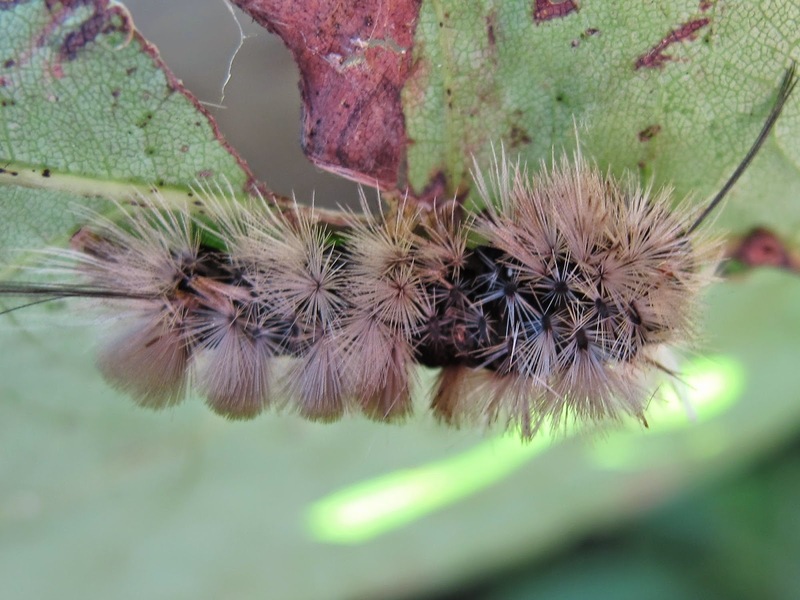 I was lucky enough to find an early instar caterpillar that still displayed its antler-like growths. It’s an attractive caterpillar, but it would have been overlooked had it not been silhouetted by the sun shining through the leaf. Not all of the caterpillars I found were in perfect health. 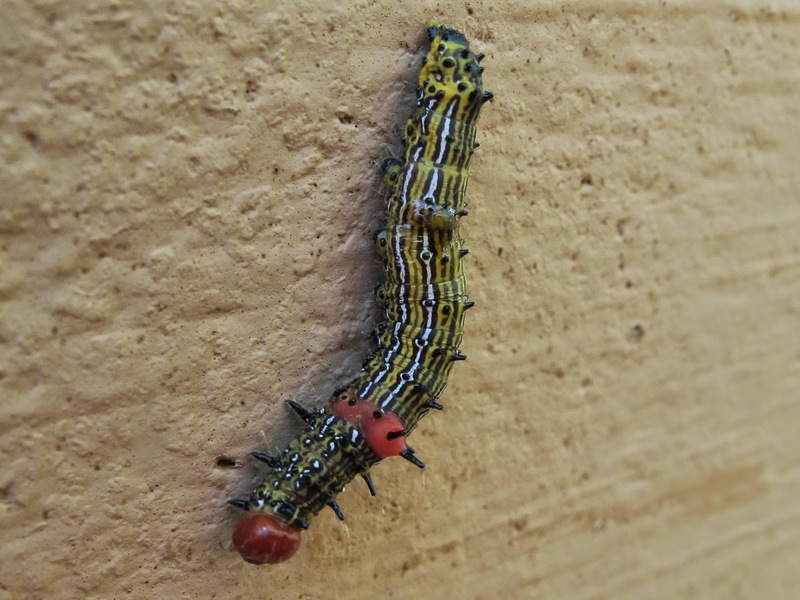 This Red-humped caterpillar was on the barn wall a short distance from a hole used by wasps going to and from their nest. Bodily fluids were leaking from a puncture located about two-thirds of the way back from the head. It moved very slowly and later fell to the ground. 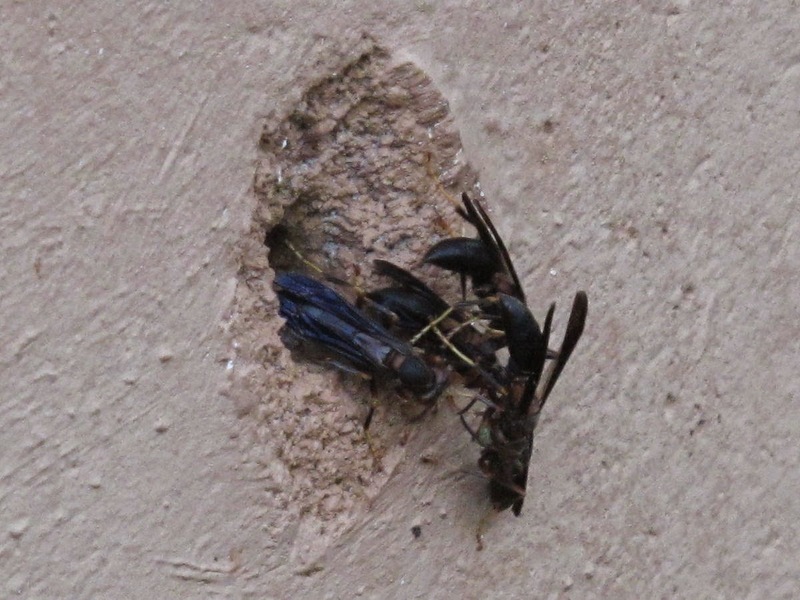 I suspect it may have been wasp prey that escaped its captor while it was navigating the entrance hole. It fled the wasp, but was still immobilized by the sting. 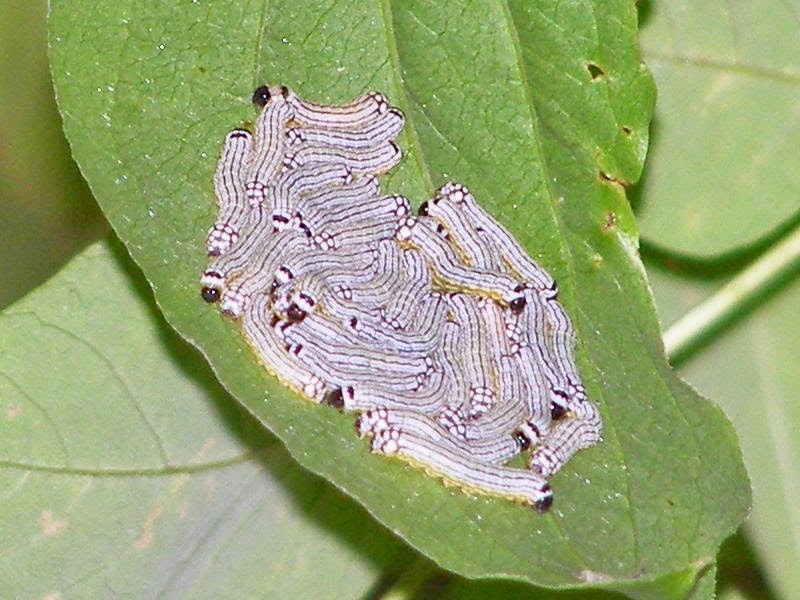 Some caterpillars had finished their lives as hosts for various parasites. This Banded Tussock is nothing but a hollowed shell. If I carried a ladder with me I might be able to reach some of those caterpillars that feed farther from the ground. There were several caterpillar-like blobs and shadows high in the trees that were beyond the ability of my eyes or camera to make clearer. The camera zoom did allow me to extend my reach some, but the results were never great. I was able to change a gray splotch into a group of early instar Turbulent Phosphila caterpillars feeding on Greenbrier. I’ll have to check back and see if I can get a better view once these guys have put on some size.